If PhotoShop is too expensive and complex (it really is for eBay purposes), you might be happy giving Fast Photos by Pixby Software a try. It’s a simple, all-in-one photo-editing program designed especially for e-commerce and eBay sellers. The developer of the software knew exactly what processes online sellers need for their images and included just those — and nothing else. There are tools for cropping, JPEG compression, sharpening, resizing, enhancing, rotating, and adding watermark text and borders. The software is a PC application that runs on Windows (versions 7, Vista, and XP). For a 21-day free trial, visit the Fast Photos website. 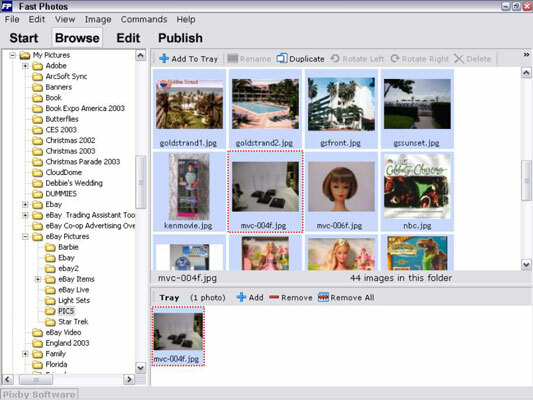 Fast Photos is all-in-one because it not only allows you to touch up your images quickly, but also has a built-in FTP program so that you can upload your images immediately after editing them. 1Open the program. Click Browse and find the directory containing your image. Make sure you know where you have saved your eBay photos. 2Find the photo, click it, and then click the Add to Tray button. The Add to Tray button is located near the top of the screen. There are many options for editing your photos. 4Click to perform any of the following tasks. Rotate: If you’ve shot your picture sideways or upside down, you can rotate it here. Crop: In Crop mode, a gray rectangle appears with corner dots. Click a corner dot, drag the rectangle until it closes in on your item, and then click Apply. Enhance: Brighten, darken, increase, or decrease the contrast and work with image gamma and color. Don’t worry — everything you do is visible onscreen and can be undone if you mess things up. 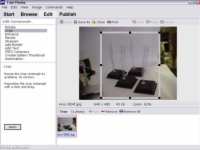 Resize: You can resize your image to the standard eBay sizes or make the image a custom size. Sharpen: Is your image a little fuzzy? Click here to bring out the details. Add border: If you want a border or a drop shadow on your image, you can apply it here (only for use in your descriptions). Add text: Type your user ID so you can watermark the images within your description (which helps dissuade those who try to use your images as their own). JPEG compress: By moving a sliding bar, you can compress the image as much as you dare. The more you compress, the less detailed the image will be. 5To save the changes you’ve made to your image, click Save As and give your file a name. Now you can upload your newly edited image to the web. Just choose Publish (on the toolbar). To set up an FTP account for uploading, click the Add button on the Publish screen. 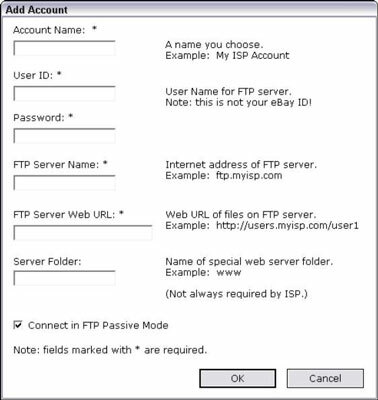 Input the data required for your FTP server, click OK, and then upload your image with a mouse click. There is also a batch mode so you can edit and upload entire groups of images at once.